Mountain goat in state of self-inflicted "shock." This is one of the goats that was being transported by airplane for transplanting on Kodiak Refuge. "Mountain goats have been successfully transplanted on Baranof and Chichagof Islands. This is a goat about to be released on Chichagof Island. Goats were transferred by airplane. 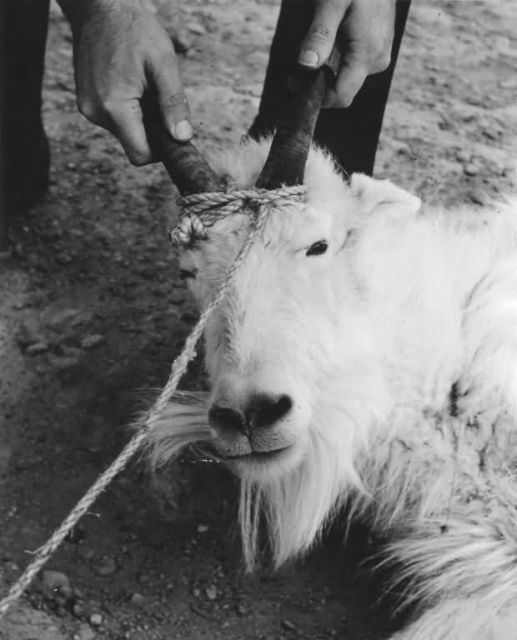 Mountain goats captured on the Kenai Peninsula and moved to Kodiak Island in 1952-1953 have provided the basis for a growing herd of these animals that will furnish added hunting opportunities in the future."